Sourcefabric, a non-profit, has announced it is working on a new platform: Superdesk, an open source newsroom tool designed by journalists that covers the entire journalistic process from source to signal. 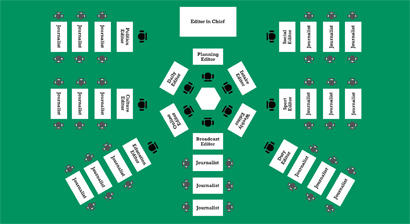 When it is released in summer 2012 Superdesk promises to be a tool newsrooms can use to pull in news feeds from social media and APIs, and then output the signal to a range of different platforms, such as television, radio, mobile, tablets and online. As free software it can be used by organisations of all sizes, from hyperlocal or global, and by print or online. As with Sourcefabric’s other two open source platforms, Superdesk will be accessible through any web browser after being installed on one Linux server. 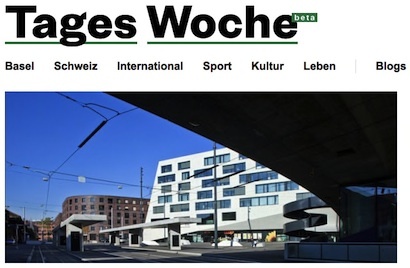 Although not yet publicly available Superdesk is already being used by new Swiss online-print hybrid paper TagesWoche, launched last month in Basel, 14 months after the city’s liberal Basler Zeitung was sold to investors. By using the platform the news organisation is helping Sourcefabric shape its development. Superdesk is a newsroom tool made by journalists, for journalists, which will offer new ways to source, manage, verify, process and present the facts behind a story. It centralises and standardises your content allowing you to move it around the newsroom to other journalists, editors or translators for further editing or sign off. Superdesk will then deliver the finished article to any platform or device – web, mobile, print, radio, television. All will be at your disposal. Adam Thomas from Sourcefabric told Journalism.co.uk that the software has been developed by journalists who understand exactly how newsrooms work. We have this ethos of creating once and publishing everywhere to really create efficiency within the newsroom. Sourcefabric has two existing platforms: Newscoop, a CMS, and Airtime, for radio stations. Newscoop is a content management system, a demo of which provides a taster. As with Superdesk and Airtime, Newscoop needs to be installed on a Linux server and can then be accessed using any web browser from a device running any OS. WordPress is great for blogs and Newscoop is great for newsrooms. It’s built by journalists for journalists and has lots of tools that journalists really like, like workflow hierarchies. It’s multilingual, you can upload to SoundCloud, it’s very friendly to audio and works very nicely with images. Being multilingual is key for the software, Thomas explained. We work in a lot of post-conflict areas, a lot of transitional democracies, where a multitude of languages are often spoken, so it is multilingual both in the back end, for the journalists, and also for the front end, so readers can get the news in different languages. It allows radio stations, for free, to download software and set up a professional radio station and manage a media archive, build shows and then output via webstream, by FM or digital. One of the radio stations using Airtime is West African Democracy Radio, a radio network operating out of Senegal but covering the whole of the West African region. They use Airtime alongside Newscoop. They get the journalists to write the articles on Newscoop, they take these and prepare them as scripts, give them to the radio shows who then broadcast via Airtime. Airtime records automatically to SoundCloud so then these shows are recorded to SoundCloud, uploaded to the web, and then shared by Facebook and Twitter. Sourcefabric launched in its current form, as a non-profit organisation, in April 2010 but the seeds of the organisation and platforms date back as far as 1999, when a team first started creating digital newsrooms. The current incarnation of the organisation has bases in Europe and North and South America: in Prague, Berlin, Toronto, Warsaw, Guatemala, Serbia and Minsk. The software is actually only seven months old. We’ve re-factored and made new versions, we’ve renamed them so these are new products. We have really tailored then for the web and for modern journalism. This entry was posted in Handy tools and technology, Hyperlocal, Mobile, Multimedia, Online Journalism, Social media and blogging and tagged Adam Thomas, Airtime, content management systems, Newsoop, sourcefabric, superdesk, TagesWoche on November 22, 2011 by Sarah Marshall.